Clan Direnni originated from the small farming village of Tyrigel which sat on the banks of the river Caomus (then called the river Diren hence the family's name) on Summerset Isle. Using his knowledge of alchemy, Asliel Direnni poisoned a barbarian tribe called the Locvar that were continuously raiding Tyrigel. With this external threat dealt with, the way was paved for the future prosperity of the Direnni farms, and generations later they would leave Summerset and travel to mainland Tamriel which would further increase their power and influence. Clan Direnni rose in power on the mainland through political maneuvering and devious machinations in 1E 355. In 1E 358, the joint army of Cyrodiilic Emperor Ami-El and Skyrim attacked the Clan Direnni in the Western Reach of High Rock. 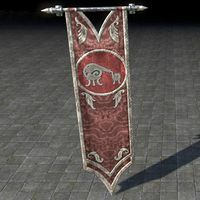 [UOL 1] With the rise of the Alessian Order in Cyrodiil in 1E 361, many Ayleids fleeing Cyrodiil migrated to High Rock to escape the order, and this exodus may have strengthened Clan Direnni as these immigrants were absorbed into their hegemony. Clan Direnni managed to conquer High Rock, some parts of Skyrim and Hammerfell in 1E 477. The Kings of the Colovian West joined with Kvatch and Skingrad to resist the Alessian Hegemony. Soon after, Skyrim under High King Hoag Merkiller and Ryain Direnni of High Rock joined the resistance. Ryain Direnni outlawed the Alessian Reform and put its major advocates to death. Direnni forces began to harass the Colovian West, pushing for the Heartland. Daggerfall became a minor base of operations for the Dirennis and their allies in 1E 480-1E 482, and the enchantress Raven Direnni was one of the earliest occupants of Castle Daggerfall. It was at that time that Prince Aiden Direnni led the Dirennis against the Alessians in the decisive Battle of Glenumbria Moors, with Raven Direnni, King Laloriaran Dynar of Nenalata, and Hoag Merkiller helping to secure the final victory. Although the Direnni Clan won the Battle of Glenumbria Moors, they could not regain the power they once had. One by one, control fell to the emerging nobility of Greater Bretony, who seized power throughout most of High Rock within two decades of the Alessian defeat. In the end, only the Isle of Balfiera was left in their hold. Around 1E 500, almost all of High Rock was freed from the Dirennis. Clan Direnni are the only known Altmer ruling family that still remains in human lands. 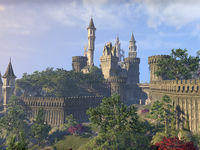 While most Direnni relocated to the Isle of Balfiera in High Rock, some members of the clan stayed on Summerset, retaining the clan's holdings around the Diren Valley. Some time in the First Era, one of the remaining Direnni—by the name of Lauriel—became highly skilled in the arts of necromancy, to the horror of her family. Facing the possibility of execution, Lauriel refused to repent and claimed that she could not be killed and would only rise again. To prevent Lauriel from doing this, the Direnni buried her alive in a sarcophagus deep below the Direnni Acropolis, and bound her spirit to it by kindling two sacred flames in braziers. A Keeper was then appointed to make sure the braziers remained lit, and the title was passed down between generations. However, the Direnni population on Summerset diminished with time, and they lost contact with their kin on Balfiera. By the mid-Second Era, the last Keeper was long dead, and the braziers had gone out. In time, Lauriel managed to manifest as a ghost, and haunted the Acropolis, hoping to contact and convince someone to release her from her imprisonment. Around 2E 583, the Soulless One entered the crypts of the Direnni Acropolis. Lauriel tried to convince them to release her by burning her remains, while the lingering spirits of the dead Keepers wished to see the braziers relit. It is unknown what decision was made by the Soulless One. Asliel Direnni is believed to have been the first individual to formulate alchemy into an art and science. As such, some Direnni banners feature an alembic in recognition of his accomplishment. Lysandus, the King of Daggerfall, was able to conquer his ancient enemies of Sentinel in part thanks to his court sorceress, Medora Direnni. Her grandfather Jovron Direnni was Imperial Battlemage to the court of the Dunmer Empress of Tamriel, Katariah I, assisting her in creating peace in a time of turmoil. His great great grandfather Pelladil Direnni had a similar role with the first ruling Potentate, Versidue-Shaie, and encouraged the Guild Act without which we would not have all the professional organizations we have today. His ancestor, many times back, was the witch Raven Direnni, who with her better known cousins Aiden and Ryain, brought an end to the tyranny of the latter Alessian Empire. Before the Psijics of Artaeum, it is said, she created the art of enchantment, learning how to bind a soul into a gem and use that to enchant all manners of weaponry. The Direnni Tower, which was used as a fortress, prison, and palace by the Direnni Hegemony, still bears their name. The mysterious Agent released Medora Direnni from a curse placed by the insane Nulfaga using a Great Unicorn Horn. Later, Medora had the hero retrieve some Lich Dust to soothe the soul of the dead King Lysandus. The hero also retrieved a strange box from the Tower for a renegade mage. Chimere Graegyn was a human retainer of the Direnni, and a master of conjuration. He was cast into Oblivion and forbidden to die after scheming against Mehrunes Dagon circa 3E 172, trapped in the Chimera of Desolation for all eternity. This page was last modified on 21 October 2018, at 07:40.